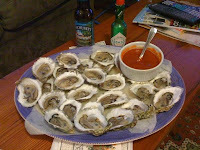 OysterEaters.com today upgraded GoShuckAnOyster.com from "Friend" to top title of "Best Friend". OysterEaters.com is being created to test drive HubSpot platform and search engine optimization. With websites like Blogger and GoDaddy, building a blog or website is simple. The challenge is having people find your website or blog and this is where HubSpot comes in. Learn more about Hubspot at http://www.hubspot.com/.